This case study examines the challenges, solution and benefits of implementing a WAN optimization solution from Riverbed Technology. Waltons employees were experiencing severe delays when accessing applications over the WAN, in particular html files, Microsoft Exchange and Microsoft SharePoint. The result was increased employee frustration and poor employee productivity levels. 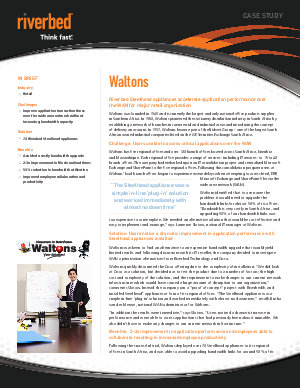 Riverbed enabled Waltons to experience a 2-3x improvement in file download times, which has improved employee productivity substantially. Waltons was also able to avoid upgrading bandwidth for 90% of its branch offices, resulting in considerable savings for the company. Read this case study and learn more.